Send me copy of email. This means that (above calculated capacity) liter of water has to be removed from the air to achieve a humidity of (above desired humidity) under the present conditions given by you. Hence while selecting you have to select a dehumidifier accordingly. For all de humidifiers, the capacity is defined as liter per hour, kg per hour etc. Present humidity and desired humidity are defined as %RH which means as a percentage of the total volume of the air. This has to be converted into absolute humidity, which means real amount of moisture content in terms of grams per each cubic meter. The difference of the present humidity level and the desired humidity level is the amount of water to be removed. Note:The calculation is true to the best of our knowledge at the time of development and we bear no contractual obligations whatsoever for the results or the calculation method. 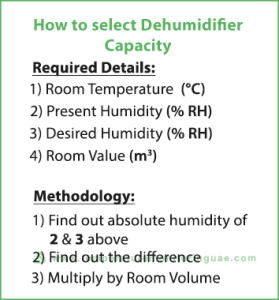 c.	Desired humidity is the humidity level to be achieved after installation of the de humidifier. d.	Room size has to be given is meters or if you know the volume, you can input the volume in cubic meters. These are used for walk in freezers, cold rooms etc. desiccant types are generally used for such low temperature environment. Swimming pools generate huge amount of humidity and needs special dehumidifiers of high capacity. These are sleek, stylish models of small to medium range of capacity machines. There are numerous models to suit your ambience. Various industries require controlled humidity during the manufacturing process and storage. These are high capacity machines.